Head-and-neck resections carry a major risk of postoperative pulmonary complications. Predisposition to pneumonia is expected in these patients due to derangement in swallowing mechanisms and compromise in laryngeal protective mechanisms. With varying degree of mandibular, tongue, floor of mouth resections, and with flap in situ, these patients develop silent and frank aspirations during the postoperative period. Majority of these patients undergo tracheostomy to help them maintain a patent airway till ability to control oral secretions is regained. This perpetuates the vicious cycle of deranged swallow with aspiration contributing to the development of pneumonia. Postoperative pneumonia (POP) adds to morbidity, mortality, and adversely affects recovery. It contributes to financial burden in terms of prolonged intensive care unit (ICU) and overall hospital stay, need for prolonged ventilatory support, and added cost of antibiotics. Advanced age, poor underlying medical condition, surgery, and a higher American Society of Anesthesiologists (ASA) grade, tracheotomy and reintubation, poor nutritional status, and delayed ambulation have shown to be associated with an increased risk of POP. Incidence of pneumonia is variably sighted in the literature ranging from 7.1% to 32.7%.,, The objective of this study is to find out the incidence of pneumonia, establish its risk factors, and formulate a treatment algorithm for its prevention based on a review of the institutional protocol. A retrospective review of patients undergoing oral cavity resection at tertiary hospital from August 2017 to July 2018 was done. Records were analyzed in terms of demographic profile, operative findings, and postoperative course. Patient's socio-demographic and clinical details shown in [Table 1]. Diagnosis of pneumonia was made by intensivist based on clinical, radiological, and laboratory findings. Presence of fever (≥38°C), cough, shortness of breath, and chest pain along with laboratory tests indicating leukocytosis and positive microbiological culture from endotracheal aspirate, Chest X-ray, or computed tomography scan demonstrating signs of inflammatory infiltrates were considered diagnostic of pneumonia. All equivocal results were reviewed on a case-by-case basis with an experienced pulmonologist. Postoperative risk factors – duration of ventilatory support, day of ambulation, decannulation, and reintubation. The patients were managed by a team of anesthesiologist and physician or pulmonologists. Review of treatment, culture isolates, microbial resistance pattern, and antibiotic choice was done. The institutional protocol for postoperative care was also reviewed. A total of 239 patients underwent oral cavity resection within 1 year. The incidence of pneumonia was 5.79% (15 out of 239). Average age of patients with pneumonia was 64.8 years and 60% were males. All had multiple comorbidities, majority (73.3%) with ASA grade of II. Average preoperative serum albumin was found to be 3.49. Majority of patients, that is, 26.67% had composite resections involving alveolar arch and tongue. Majority had reconstruction in the form of free flap (46.6%) with fibula flap being the most common. Average intraoperative time was 10.5 h. About 80% of patients had undergone peroperative tracheostomy. The average duration of ventilatory support in the early postoperative period was 14 h. Delayed ambulation beyond 4 days was found in three patients. Average time for decannulation was 5 days. Eight out of 15 patients had to be shifted back to ICU postdevelopment of pneumonia, out of which three had to be reintubated. Most common isolate was Pseudomonas aeruginosa (40%), followed by Klebsiella pneumonia (33.3%). Twenty-six percentage were multidrug-resistant strains. Average hospital stay was found to be 30.6 days in this cohort of patients of pneumonia. Subtle signs of tachycardia, tachypnea, leukocytosis, fever spike, and persistent tracheal secretions should be dealt with caution. Any of these should warrant radiological and laboratory tests. Tracheal aspirate culture sensitivity should guide the type of antibacterial therapy. Blood counts and C-reactive protein can help in deciding response to treatment. In this study, the incidence of POP was found to be 5.79%. Lower incidence in this study could be attributed to institutional practices and quality of care provided in terms of the availability of round the clock 1:1, patient-nurse ratio. All patients as a routine receive postoperative respiratory care including regular oral and tracheal suctioning, use of a nasogastric tube with check on placement before every feed, postural drainage, chest physiotherapy by percussion and vibration, deep breathing exercises, and early mobilization. The institutional protocol for care of all postoperative patients is shown in [Figure 1]. Pulmonary contamination can begin in the intraoperative period itself. Oral cavity with its enormous load of microorganisms act as a reservoir through which spill over into airway can be expected in various scenarios. It has been shown that improving patient's oral hygiene prevents POP. The patients should be advised to start through betadine gargles 1 week before the surgery. Oral care in the form of routine brushing of teeth on the day of surgery and preoperative betadine mouthwash helps in reducing the oral microbial count. Postintubation, careful securing of endotracheal tube with adequate inflation of cuff helps in sealing the airway from the potential leak. Tube malpositioning with fall in cuff pressure can affect the adequacy of this seal predisposing stagnated cesspool of saliva and blood entering lungs. 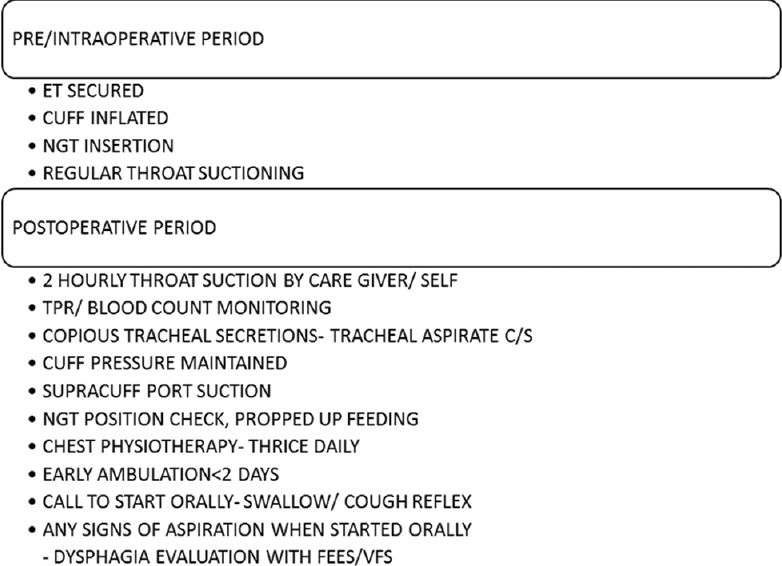 Repeated oropharyngeal suctioning during the surgery and mandatory suctioning postprocedure is of utmost importance. It is useful to place a transnasal soft suction catheter in the oropharynx and supraglottis when excessive bleeding and intraoperative contamination is to be expected. The nasogastric tube is placed in a dependent position to ensure minimal reflux of gastric contents during the surgery. Caution should be exercised when peroperative tracheostomy is performed, especially during tube transfer as pooled secretions are likely to enter the bronchus. Numerous reasons can be proposed for the association between operation time and POP. Prolonged operation time results in longer duration of anesthesia and mechanical ventilation which can lead to abnormality of deglutition and respiration, gas exchange, and atelectasis. Both type and time of anesthesia have been reported to be associated with the incidence of POP, and longer mechanical ventilation was related to an increased incidence of POP. The maintenance of tracheal seal with the inflated cuff for early postoperative days is essential. Patients with oral resections and insensate flaps in situ have tendency to develop pooling of saliva. If the seal imparted by tracheostomy tube fails, the secretions will find entry into the airway. Caregiver must be taught to repeatedly suction oral cavity and throat. Whenever cuff has to be deflated, suctioning from throat and supra cuff port must be done. Check on the positioning of nasogastric tube before feeding and feeding in sitting or propped-up position can prevent possible aspiration. Early mobilization with initiation of chest physiotherapy helps pneumonia prevention. Encouraging patient to cough out secretion, spit, or self-suctioning oral cavity can also be helpful. Another crucial event in the postoperative phase is initiation of oral alimentation. Attention to patient's capability of maintaining clear airway with effective cough reflex predates decision for trial with sips of water. Only if the patient passes the water swallow test, oral diet is allowed with close observation for any signs of aspiration. In the presence of which ancillary tests such as functional endoscopic evaluation of swallowing and videofluoroscopy should be done. POP following oral cancer resections are at risk for developing pneumonia. Data from our cohort indicated a much lower incidence compared to published literature. We attribute this to our routine practice of ICU care in the immediate postoperative setting with a nursing care ratio of 1:1, postoperative early mobilization, frequent tracheal toileting and chest physiotherapy, early diagnosis of pneumonia, and prompt initiation of treatment. This study would not have been possible without the help from nursing staff at the head-and-neck surgery ICU, Amrita Institute of Medical Sciences. Yeung JK, Harrop R, McCreary O, Leung LT, Hirani N, McKenzie D, et al. Delayed mobilization after microsurgical reconstruction: An independent risk factor for pneumonia. Laryngoscope 2013;123:2996-3000. 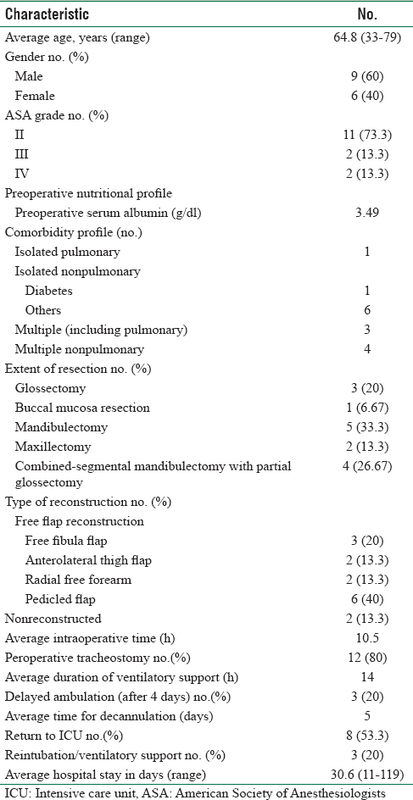 Damian D, Esquenazi J, Duvvuri U, Johnson JT, Sakai T. Incidence, outcome, and risk factors for postoperative pulmonary complications in head and neck cancer surgery patients with free flap reconstructions. J Clin Anesth 2016;28:12-8. Ligh CA, Nelson JA, Wink JD, Gerety PA, Fischer JP, Wu LC, et al. An analysis of early oncologic head and neck free flap reoperations from the 2005-2012 ACS-NSQIP dataset. J Plast Surg Hand Surg 2016;50:85-92. McMahon JD, MacIver C, Smith M, Stathopoulos P, Wales C, McNulty R, et al. Postoperative complications after major head and neck surgery with free flap repair – Prevalence, patterns, and determinants: A prospective cohort study. Br J Oral Maxillofac Surg 2013;51:689-95. Xu J, Hu J, Yu P, Wang W, Hu X, Hou J, et al. Perioperative risk factors for postoperative pneumonia after major oral cancer surgery: A retrospective analysis of 331 cases. PLoS One 2017;12:e0188167. Schwam ZG, Sosa JA, Roman S, Judson BL. Complications and mortality following surgery for oral cavity cancer: Analysis of 408 cases. Laryngoscope 2015;125:1869-73. Dillon JK, Liu SY, Patel CM, Schmidt BL. Identifying risk factors for postoperative cardiovascular and respiratory complications after major oral cancer surgery. Head Neck 2011;33:112-6. Ishimaru M, Matsui H, Ono S, Hagiwara Y, Morita K, Yasunaga H, et al. Preoperative oral care and effect on postoperative complications after major cancer surgery. Br J Surg 2018;105:1688-96. Tusman G, Böhm SH, Warner DO, Sprung J. Atelectasis and perioperative pulmonary complications in high-risk patients. Curr Opin Anaesthesiol 2012;25:1-10. Poelaert J, Haentjens P, Blot S. Association among duration of mechanical ventilation, cuff material of endotracheal tube, and postoperative nosocomial pneumonia in cardiac surgical patients: A prospective study. J Thorac Cardiovasc Surg 2014;148:1622-7.